Josephine is everything a femme fatale should be—beautiful, alluring, dangerous. And she’s also cursed. The heroine of the Image Comics series FATALE by Ed Brubaker (VELVET, Captain America: The Winter Soldier) and Sean Phillips (Criminal) is irresistible to men, who will do anything to be with her once they’ve fallen under her spell, inevitably leading to their ruin and unimagined horrors. Immortal, Josephine must bear witness to their suffering again and again as she struggles to unravel the mystery of her own existence. 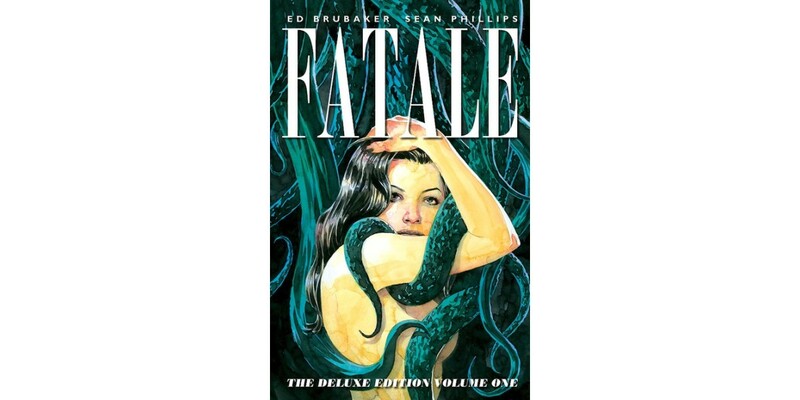 A lush combination of crime noir and Lovecraftian horror, FATALE was nominated for five Eisner Awards in 2013 (Best Continuing Series, Best New Series, Best Writer, Best Penciller/Inker, Best Cover Artist). And now Image Comics is proud to announce a special hardcover edition that collects the first ten issues of the critically acclaimed series. In this first volume, Josephine’s quest will lead her into the depths of an ancient evil, a path that takes her from 1950s San Francisco, where crooked cops hide deeper evils, to mid-'70s L.A., where burnt-out actors and ex-cult groupies are caught in a web around a Satanic snuff film. Fatale: Deluxe Edition Volume One is a 288-page full color, oversized hardbound book, packed with behind-the-scenes extras from the creative team, including art, stories, sketches, and layouts. The collection will also include several essays on genre fiction by Jess Nevins, which previously appeared only in the single issues. FATALE creators Brubaker and Phillips made news in January when they announced a revolutionary five-year publishing deal with Image Comics at the publisher’s Image Expo event. Image Comics, the largest independent comic book publisher in the United States, will be the sole publisher of the team’s work, giving the the longtime collaborators freedom to develop whatever new projects they choose. After FATALE ends at issue #24, their first new work will be THE FADE OUT, a crime story set in 1940s Hollywood.